Routledge is proud to be re-issuing this landmark series in association with the International African Institute. The series, published between 1950 and 1977, brings together a wealth of previously un-co-ordinated material on the ethnic groupings and social conditions of African peoples. 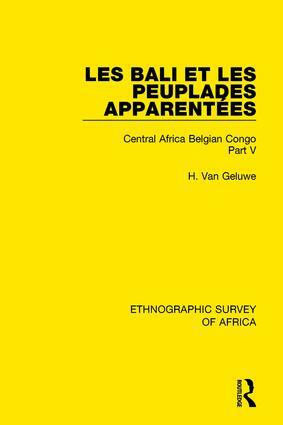 Each of the 50 volumes will be available to buy individually, and these are organized into regional sub-groups: East Central Africa, North-Eastern Africa, Southern Africa, West Central Africa, Western Africa, and Central Africa Belgian Congo. The volumes are supplemented with maps, available to view on routledge.com or available as a pdf from the publishers.